This past Saturday I had the opportunity to attend an outstanding event that featured veterans from just about every conflict from World War II to Iraqi Freedom to speak to an audience of Young Marines, Civil Air Patrol and other interested persons. It was quite a high to be amongst all those heroes, most of whom are in the twilight of their lives, and listen to them speak about what they endured in battle for this country. What made it even more special was attending the event with my father, a veteran of the Vietnam War, along with my nephew who is the next generation of our family and one of whom the defense of our freedom may fall upon one day. The first panel of veterans we listened to were from the 3rd Platoon, E Company, 28th Marines. These men may not look like much now, but don't let the passage of time fool you. It was these men and those like them that took Mt. Suribachi and in that iconic image of World War II raised the American flag at its summit during the harrowing Battle of Iwo Jima. Over 60 years have passed since those bloody days they spent on that tiny island fighting the Imperial Japanese but when they spoke about it, it seemed like for them it was yesterday. The details they recalled and how they felt were amazing. The character of these men still shown through and their personalities were quite apparent. The veteran at the end with the cane was a bit of a cut-up and the spark of mischief in his eyes didn't go unnoticed. 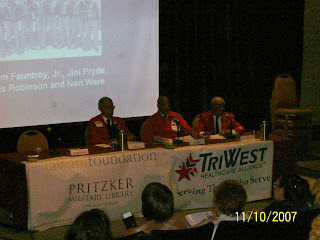 Next up were 3 Tuskegee Airmen. For those of you who may not know, the Tuskegee Airmen not only had to contend with the enemy we fought in World War II but also the racism of their own side. It was interesting to listen to them speak about the war and the bigoted nonsense they faced from their fellow soldiers. Their feats are damn near unparalleled as they were determined to fight for their country even though many of their fellow Americans didn't believe that blacks were capable of doing so let alone whether they even should be allowed to. Perhaps many had forgotten the courage of such units as the 54th Massachusetts Infantry. The Tuskegee Airmen more than showed what feats of valor they were capable of as they tore into the enemy and never lost a plane under their protection and were one of the most highly decorated units ever. I couldn't help thinking about gays serving in the military and the similarities, though differences to be sure. Blacks stubbornly refused to give up and showed the country that they were just as capable as anybody else, I just hope that we are given the same chance. Many of the same arguments used against integration of the military, especially concerning "unit cohesion", are thrown about today to keep gays out. It would seem that we learn very little from our own history and keep having to repeat certain aspects of it. 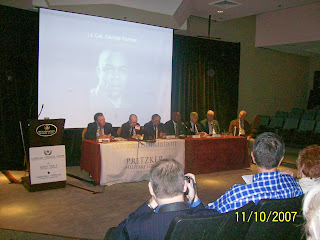 Unfortunately I missed the panel of Korean War veterans as by this time my nephew was pinging off the walls with hunger. If there was one complaint I had about this event it was the lack of breaks in between presentations. It had to be difficult on the older members of the audience (perhaps the different panels as well) and I know for certain it was on the younger ones. Yet I was a bit hungry myself as was my father, so off we went to re-fuel. I would have liked to listen to what they had to say but I guess I'll have to find a book about it. This group of veterans from the Vietnam War were probably my favorite. I say that not because their service was any more special than that of the veterans of the other wars our country has been in, but because it meant so much to my father. Growing up he rarely spoke about the time he spent in Vietnam and this event helped him open up a bit afterwards and share some of his experiences. For that I am very grateful to these men even more so than for what they did over there many years ago. Shown in this photo are Lt. Gen. Hal Moore along with some of his lieutenants and soldiers who fought with him during the famous Battle of Ia Drang. Mel Gibson a few years ago turned a book by Moore and Joe Galloway into the movie "We Were Soldiers". I haven't had the chance to read their book or see the movie yet, but you'd better believe I'm going to now. 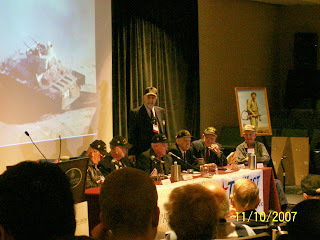 After their presentation was over, I was able to get just about all of these men to sign the book on the battle, as my father was likewise able to, and I'll treasure that always. 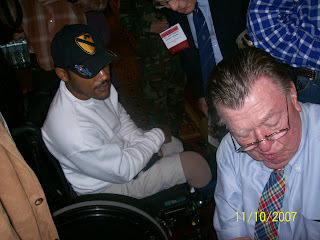 The man in the wheelchair is former US Army Specialist Travis Webb, who lost both of his legs in Iraq. Even though there were great differences in their ages and they had fought in different wars, the bond between him and the Ia Drang vets was strong. 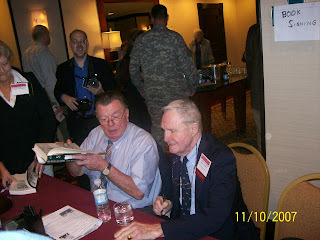 Galloway and Moore signed his copy of their book and what they along with the other vets said to him made it apparent that they kept in close contact with him before this event and would do so afterwards. For the final part of this post, I'd like to put up this video of Lt. Gen. Moore responding to a question about what young people can learn from the service of veterans like him and what advice he could give on how they can apply these lessons to their lives whether in the military or civilian life. My apologies for the poor quality of the video, but the sound is clear enough and what Lt. Gen. Moore has to say is truly inspiring. In this youth-obessed culture of ours, we tend to forget about the sacrifices and wisdom of the generations that have come before us. That "old fool" next to you or in your family may have been where you are now and may have knowledge you lack that would do you good in life. Even if the circumstances they went through were different, there still is something we can learn from them. Whether they served in the military or not, many of them have shown the strength of their characters at various times in their lives and regardless of how much their bodies are failing them now, for most of them their minds are still intact. Lord knows I remember my great-grandmother who by the age of 99 had outlived 9 of her 13 children yet even though her body was worn out was still sharp as anything. My own father is getting on years now but there still isn't any man who can hold a candle to him in my eyes. God keep all of our veterans and my thanks to them for their service. I'm sorry you didn't get the hear the Korean War presentation. That's where my father served so long ago. As for the battle of Battle of Iwo Jima, my grandfather died on that island. A man I never knew but will be forever grateful for my freedom! Yeah I was disappointed to miss it, but overall the experience was fantastic!